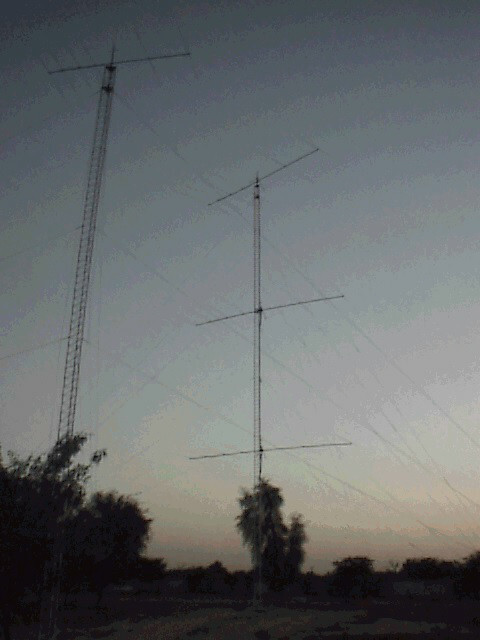 A61AJ was kind enough to send along these pictures of the 20m set up. This is the StackMatch selector in the all three stack position. They tell me they had lots of fun running the West Coast guys one night. Views of A61AJ's 20m three high stack on his 150 ft tower. Rich, KE3Q sends this update - Jan 1999. "A61AJ's 6 element KLM's (each on a 57' boom), at 50', 100', and 150'. W3UR, T93Y, T97M, PA4AO, and KE3Q made over 3,000 QSOs on this array in CQWW CW '98. It was a pleasure to be back at Ali's for CQWW CW for the second year in a row in November '98. When we arrived, Ali informed us the bottom 20 wasn't working. So, T97M gamely volunteered to climb and check it out. We figured fixing the 50'-high antenna should be pretty easy. Well, Edin quickly discovered it was the top antenna, the only rotating one, that was the real problem! Edin, Boris (T93Y) and non-ham-friend-of-Ali's, Chris, went to the top of the tower to fix it. A few hours later, Ali joined the others at the top and hiked out on the boom in his mountain climbing gear, the coax problem at the yagi's feedpoint was fixed. A hard job well done with the start of the contest approaching. The StackMatch really worked well. It gives you a lot of confidence to know you're not only the only station on from your country so you're a new mult for the station on the other end every QSO on every band throughout the weekend, but you're using an array of three big monobanders! Suffice to say, not too much trouble getting or holding a frequency. It's fun to switch to each of the yagis individually to see how it changes the strength of the signals coming in -- are the Europeans (or North Americans) coming in at high angle, medium, or low angle? Generally, as I've seen operating at W3LPL (and hearing Frank's Antenna Forum talks), "all three" is usually best. With just the top antenna rotating (so far anyway), we could turn that one to Central Asia and UA0 to pick up some of those, while running Europe. A quick turn of the StackMatch knob and you're on the top antenna alone. Nice way to get the nearby VU and XZ1N, etc. the first call. It was a great pleasure to finish the contest with 32 million points to blow away the old VS6WO Asian multi-multi record of 17 million. I remember seeing Dave Patton's Dayton slideshow on that operation. Well, P3A in Cyprus busted the old record too with a slightly lower claimed score, so we're eagerly awaiting the official result. A year earlier, when I was brought in on the A61AJ project, just two towers, with many monobanders on long masts (with at least one tribander mixed in among the monobanders!) were planned. Being steeped in the W3LPL philosophy of ease of installation and ease of maintenance (which I have yet to follow in my own station), I strongly suggested just one monobander atop each tower, and a start with four towers instead of two, one for each band 40 through 10, with a separate tower for 80 installed later (because the 2-el 80 had already been acquired and there was some inertia to install it built up). So far, Ali's installation has been more or less following my suggestions. So far the 20M tower is the only one with stacks, and it has steel guys at present (not one of my ideas), so the two bottom yagis are looking out through mostly non-broken-up steel guys. I hope the guys can be upgraded to Phillystran or equivalent soon. I've suggested increasing the height of the 40 m tower (to 200’ preferably) to get enough vertical height for a second beam. A StackMatch will definitely be the way to go in that and any other stacks installed. The crew of W3UR, T93Y, T97M, and PA4AO were certainly a pleasure to operate with. We kept the four stations (that's all there were at this point) on the air for the entire 48 hours, always with one op on break. It worked out very well for five ops who were really eager to operate! We figure with six stations instead of four, and an appropriate increase in great ops, we should be able to do a lot better next time. See Ali's website at www.a61aj.com for more. He has 2 other StackMatches ready to go up. And they say they will need more. These guys are real serious. They also have 3 Mini StackMatches which I think will be used to do a 6 high stack on 15 or 10 meters. Watch and see what Ali and friends are up too. 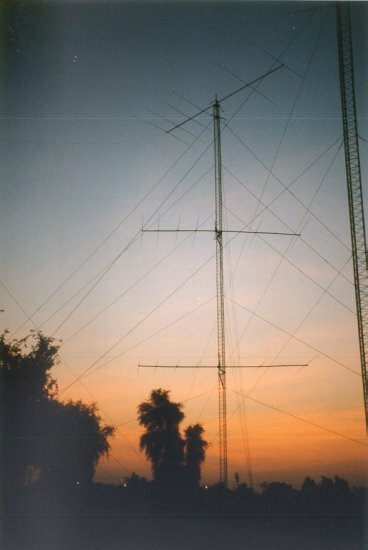 Rich, KE3Q adds this comment "As of August, 1999, Ali is planning a second 20M tower, a four-high stack on a 200' tower, hopefully by CQWW CW '99. A StackMaster will be used for the antenna selection."